The Crowned Lapwing, Vanellus coronatus (also "Crowned Plover") occurs from the Red Sea coast of Somalia to southern and south western Africa. 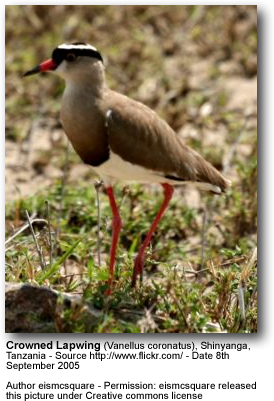 It is related to the more localised Black-winged and Senegal Lapwings with which it shares some plumage characteristics. The Crowned Lapwing is easily recognised by its combination of brown and white colours, with most tellingly, a black crown intersected by an annular white halo. Adults are noisy and conspicuous. Males measure on average 3% larger than females. Juveniles are dull versions of the adults, vermiculated on the wings and mantle, the legs yellowy rather than red and the bill lacking the red base. Crowned Lapwings prefer short dry grassland which may be overgrazed or burnt, but mountains are avoided. In higher rainfall areas like parts of Zambia and Zimbabwe they occur mainly as dry season visitors. In dry regions of northern Botswana however, they are attracted in large numbers when good rainfall occurs. In southern Africa their highest concentrations are to be found in the dry central Kalahari region. Although generally outnumbered by Blacksmith Lapwings they are the most widespread and locally the most numerous Lapwing species in their area of distribution. Their numbers have increased in the latter part of the 20th century after benefiting from a range of human activities. Longevity is up to 20 years. Crowned Lapwings and the more localised Black-winged Lapwings sometimes associate and do not show mutual aggression, even within breeding territories. Different Crowned Lapwing males do however posture aggressively when nesting territories are established. The loser in an encounter assumes a special posture to signal his defeat. Bare part colours of males brighten in the breeding season. Different types of display flights lure the female to the defended territory. A female accepting the male and territory will follow the male during his display flight. Mates may be retained for life. Egg-laying is timed to precede the rainy season and most incubating is done by the female. The male only assists on hot days when he either incubates or shades the nest.